The City of Northfield’s fiber consultant has finished surveying residents on their current use of cable, phone, and internet services (PDF of the questions asked). (See our podcast with City IT director Melissa Reeder back in Nov.) Melissa told me yesterday that she expects the consultant to report back to the City Council in late March. 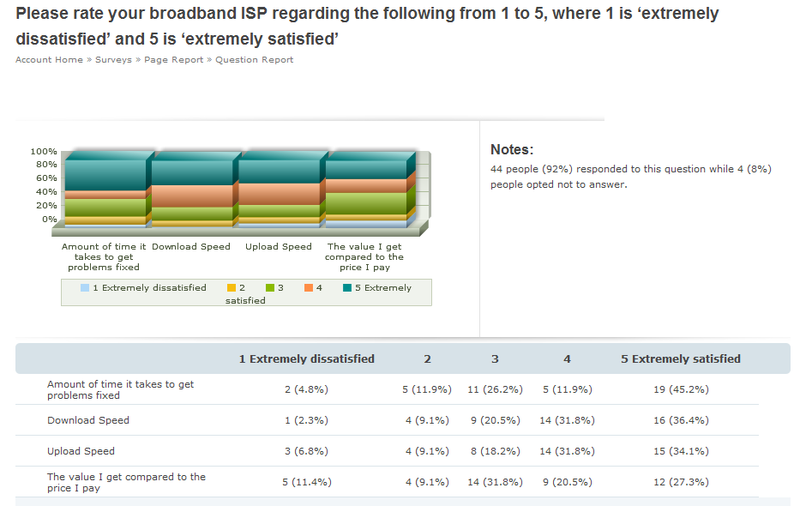 In the meantime, here’s a small straw poll on the level of satisfaction with area broadband ISPs. Then discuss! speaking of wastes of money… seriously what is the consultant going to tell them that they don’t already know. I’ve had problems with qwest and charter. qwest is down right annoying in their lack of action and the constant phone calls, mailings, and personal visits to try to win back my business. Had they spent half the effort to keep me happy when I was a customer as they have to win me back I might still be using them. St. Olaf is great, I recommend their service for businesses. Living in the country I now have Northfield Wifi, and I am a very VERY satisfied customer. Previously we had satellite internet, paying a ridiculous monthy rate, and it was down more than it was up. Pity me, for thine hath Charter. My speed at home is decent but I get dropped at least once/day and have to ‘power cycle’ the modem/router combo box. So is that why the prices are going up again? I wanted to be one of the early adopters for Northfield WiFi, but when they came out to do the site survey, there were two very large pine trees in the line of site between my house and the dorm tower at St. Olaf. Has anyone heard if they got the secondaries up on the water tower south of town yet? I will have to give them a call. What shocks me about the providers is that bandwidth is actually getting cheaper, and the rates being charged by providers is getting more expensive. One would figure that for the price you are paying, you could get some redundancy, failover, and close to 24/7 uptime. Charter is NO WHERE near that, and not even close to their advertised speeds. Charter came out and ran new cable all the way from the main box in the rear yard, installed a new D-marc, and ran new cable all the way to the modem. I have 10MB/1MB service, and most of the time I am in the high 9’s, but you can sure see the latency during peak periods. It is really difficult to carry on a video conference or live meeting, and get dropped in the middle of it. To go back to your fluff post regarding working and living in Northfield… I would love to. Give me some stable bandwidth, and telecommuting will be an option. With the infrastructure I have now, telecommuting can only be done on a case by case basis. I would love a “work center” with some support facilities, conference room, and bandwidth. I would love to go to “work” there, pay a daily rate, and “work virtually” rather than make the commute to St. Paul. I have the work laptop, I have cellular connectivity, and all the tools, but there are some work activities that I do that take tremendous bandwidth, such as video conferencing and Voice over IP. I am at the point where I have to deal with what I have, or go to business level connectivity, which would be cost prohibitive for only telecommuting 1-2 days per week. Nfld News managing editor Jaci Smith has a cable company horror story in today’s paper: Fun and games with the cable company. 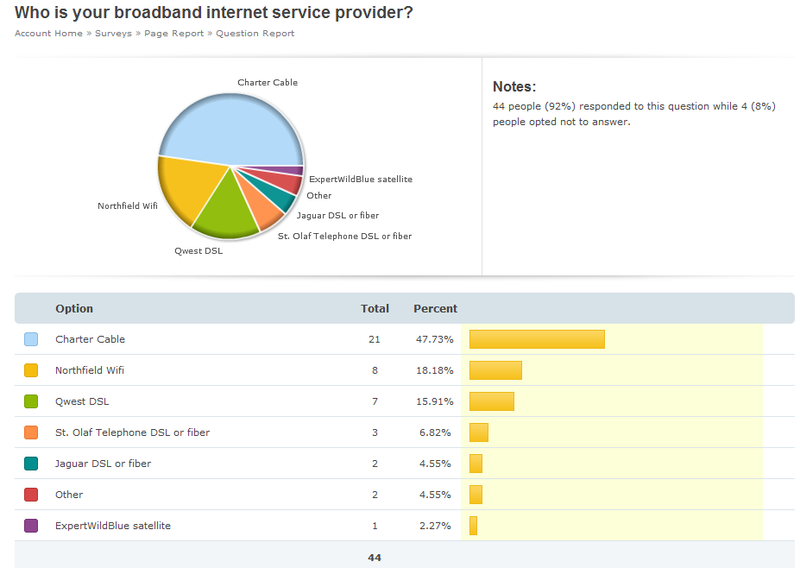 I’ve closed the broadband ISP straw poll. Just shy of 50 responded. Here are two images that show the results. Who is your broadband ISP? Hi, Just looking at your straw poll for ISP. Is it possible to link satisfaction report with the specific provider? Just wondering how other people have felt about Jaguar (our provider, who I have a love/hate relationship with) and others. Thanks.